Turn your tap water into pure delicious drinking water for just pennies a day ! While Today's tap water can contain a broad range of impurities and contaminants. 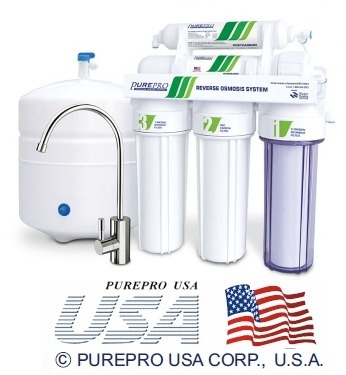 PureProR Reverse Osmosis systems tackle the broadest spectrum of water impurities possible. Only RO filtration is capable of reducing impurities ranging from bacteria and viruses to agricultural run-off products like pesticides and fertilizers, to dissolved metals like lead, arsenic and iron. Studies have shown that RO technology is one of the more effective technologies at reducing trace contaminants like perfluorocarbons and trace pharmaceuticals. PurePro Reverse Osmosis (RO) is recognized as one of the best available technologies for producing best quality drinking water. It's also the same method used by many bottled water companies to make safe and great tasting water. No other home water treatment system can offer you as much protection and reliability. QC105 comes complete with a NSF certified 3.2 gallons water storage tank, USA made membrane and all the necessary fittings, installation kits, extra color 1/4" tubing, and a long-reach chrome faucet. QC-105 system provides your family with premium water for drinking and cooking at a fraction of the cost of bottled water. That means no more deliveries, heavy containers, storage problems, spills, or bottle deposits. With only 1 micron rating, provides effective filtration to protect your membrane. It provides for improved membrane performance up to 98% of TDS rejection.